The nose has crisp smoke, salt and vinegar crisps and lemon, with a hint of thyme. The mouthfeel is thin with no cling. The body has pineapple juice, vinegar, oranges and crisp smoke. 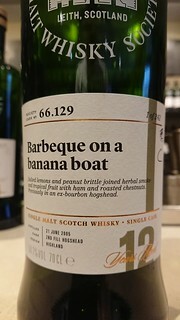 The finish is smoke and pineapple with a hint of vinegar. Water brings out thin, rapdily expanding whorling that settles into brief mottling. The nose gains banana and loses the vinegar notes. The body gains smoke and brine, and loses the pineapple and oranges. The finish gains more smoke and loses the pineapple. A decent peated dram, but a little too much brine and vinegar for me. One for cold autumnal evenings - maybe for November 5th in a hipflask?